The Royal Commission of Ancient Monuments in Scotland records a number of different antiquities that point to some human occupation in the area early on. In neighbouring Strath Halladale there are a number of ruins of rectangular and circular buildings. Similar evidence exists in Strathy today, such as left Daila'Bhaite. About 1/2 mile south of the Strathy Point road end (NC 8310493) in the hill can be found the Priests Stone. It would have marked the grave of a person who had high standing in the community. Local legend says it is the grave of a priest and if disturbed will cause a great storm. After the foundation of the abbey of lona by St. Columba and his Irish priests, they then travelled the Highlands. The stone is either of the early Christian period (7th Century) or dates from the much later period of the 13th Century when a chapel existed in Strathy at the time of Bishop Gilbert. Though the stone once stood it has long since fallen. On the hillside to the east of the Priest's Stone there are numerous hut circles and enclosures dating form the Bronze or the Iron Age. The area around Strathy is rightly known as Mackay country - this clan has predominated for asignificant period of time. While the origins of the clan are hidden in the depths of time the first recorded chief is Dubh Angus or Black Angus from the 15th century. It was in 1415 that Donald, Lord of the Isles, transferred Strathnaver and Strath Halladale to Black Angus and his son Neil. The name Mackay takes it name from the Gaelic word Aoidh, there is no direct English translation. The early clan chiefs were descended from the ancient Pictish rulers of Moray, Morair Maghrath. Six hundred years of Far North history were dominated by the chiefs of Clan Mackay. Much of this history involves the territorial warfare between the Earl of Sutherland and the Mackays. For 150 years after about 1400 there were ten major battles. At its height in the 15th century the chief could raise four thousand men and they saw battle at Bannockburn, Flodden and Solway Moss. However it was not just the Mackays that were keen on fighting. The Gunns beat the Siol Iver in a clan skirmish in 1589 at Acha-main-merkel in the heights of Reay, at Strathy. During the religious tension in Scotland at the end of the 16th century the Mackays found a further outlet for their battling. Donald Mackay, the first Lord of Reay, was born in 1590 and became clan chief in 1614 and was probably the first chief to turn Protestant. The first Lord of Reay, a title created in the early 17th century, owned land from Assynt and Cape Wrath to West Caithness. Post-Reformation the clan fully supported the Protestant cause and Donald Mackay took a contingent to the continent to do battle in the Thirty Years War, and gained a Peerage and became Lord Reay. Lord Reay's dedication to the Protestant cause was not without penalty. The costs he acquired during the Reformation resulted in him selling parts of his land to the old clan enemy the Earl of Sutherland. Sale of land continued until the Seventh Lord Reay sold the remaining clan lands to Sutherland in 1829. In 1875 the ninth Lord Reay dies without issue and the succession passed to a Dutch branch of the family. 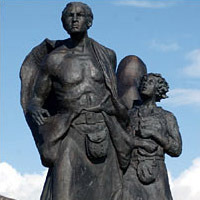 Mackay of Strathy was a younger brother of the first Lord, and was granted the lands around Strathy for himself and heirs. The laird's house was located on the east bank of the river near to its estuary. No evidence of this landmark exists today. The fighting men of the clan of Mackay earned a reputation on the battlefield, for example in the defence of the Pass of Oldenburg (Thirty Years War). They were the first regiment to adopt Highland dress as its official uniform. Mackays fought on the government side during the Jacobean uprisings of 1715 and 1745. Early origins of the Sutherland Highlanders comprised mostly of Mackays They formed the "Thin Red Line" during the Battle of Balaclava and provided the lone piper at Waterloo. The later stages of the passing of Mackay lands to the Earl of Sutherland marked a change in the stewardship of land by its owners. Many argue that it was not for the best and it has had an everlasting effect on both the people and land around Strathy. Prior to the clearances starting in the late 1700's there were four crofters working the land in Strathy. The clearances marked a realisation of the landowners that their land was worth more with sheep and deer on it than with tenants or crops. Indeed such was the desire for deer hunting by the likes of the Earl of Sutherland that he insisted that the building of the Inverness to Wick railway line did not follow the shorter route along the coast but was diverted inland as far as Forsinard. Initially during the late 1700's families were relocated by their landlords to areas along the coastline. A little north of the east coast village of Helmsdale the settlement of Badbea lies testament to the conditions that these disposed people found themselves in. However landlords soon found that they had little taste to deal with the families they had moved off the land and the evictions became increasingly violent. Henchmen would be employed to serve eviction notices (often verbally and with no warning) and would then proceed to burn the homes and other buildings in the hamlets. There is some evidence that some perished in their burning homes, others died due to exposure or starvation if they were evicted in the winter months. With no taste to help these people there was an active policy to forcibly move people onto theemigration boats bound for Canada, the USA or Australia. Written records were forbidden and so it is difficult to quantify the number of families butchered or forced off the land that they had occupied for generations. Some researches have looked at agricultural and tax records and have estimated that 750,000 men, women and children suffered the consequences of the land owner's greed. This was the context of much of the north of Scotland during the 1700's and 1800's. Strathy was by no means unaffected. Strathy and the neighbouring village of Armadale were clearance villages where some disposed families were resettled. In 1790 Captain John Mackay sold the land in Strathy to William Honeyman, an Edinburgh lawyer. Honeyman was later to become Lord Armadale of Strathy when he was appointed a judge in Edinburgh's Court of Session. He also has the dubious distinction of probablybeing the first land owner in the north of realising his land was more valuable tohimwith sheep than tenants. However he was distanced from the process by letting much of the land to Northumberland farmers and can be considered to be an absentee landlord. By 1809, the laird's house in Strathy was in a "ruinous state" according to John Henderson's tour of the Sutherland. Honeyman divided the estate into three parts: Strathy Mains (the lands at the estuary of the river, behind the laird's house); the old sub tenanted settlements stretching for five miles up the Strathy River and occupied by ten families; and his new creation the Armadale Sheep Farm. By 1812 the Armadale Sheep Farm boasted being one of the largest in the country with two-thousand head of Cheviot sheep. Honeyman sold the land at Strathy in 1813 to the Marquis of Stafford, husband of the Countess ofSutherland for £25,000. The two to three thousand sheep of Armadale swelled the Sutherlands sheep head to count to upwards of 18,000 sheep. Two years later the clearances were continuing and families in Upper Strathy had been cleared to the coast along with those from Strathnaver. Strathy Mains, the main farm on the Strathy Estate was split into the now recognisable East and West Strathy. From the estate map of 1815 the Duke and Duchess of Sutherland's desire for "improvement" can be clearly seen. Settlements down the Strathy River, such as Bowside and Achrugan, were to be cleared and families resettled in "allotment" communities in Baligill, Strathy Point, Brawl and Portskerra. These "allotments"are still seen today in the 1:25,000 scale OS map (OS Explorer 449 Strath Halladale and Strathy Point) as thin strips of land that were meant to be sufficient to allowafamily to survive. Often the quality of the soil was such that upwards of 75% ofthe land area was unfit for cultivation. This was at best fortuitous for the landowners and at worst was by design to ensure that the families were encouraged to go elsewhere. Elsewhere was to the industrial revolution and all its squalor or further a field to Canada, Australia etc. Perhaps the best description of the history of the area between the clearances and the end of the First World War is given in " North Coast Diaries " by Frank Bardgett. The village has had four churches; built between 1828 - 1910, two of which are now used for other purposes. The earliest church was built to a Thomas Telford design in 1828 and is located at the bottom of the valley to the west of the river. As testament to the resilience of the Strathy people they utilised the limey rocks of the Baligill Outlier and built two limekilns. Built probably around c.1820 and c.1870 they were stone lined and were fuelled by peat. Also a meal mill from c. 1800 was converted to a woollen mill in c.1860. Traces still exist of a dam and lade. The road bridge over the Strathy River was built in 1932 and had a reinforced-concrete bowstring tied arch of a span of about 100 ft and rise of 30 ft. It was demolished between its abutments in 1994 and now has a modern deck of composite beams of steel girders and a reinforced concrete slab. At the west end of the village is the Strathy Inn and road to Strathy Point. From the end of this road you can walk to the lighthouse. Built in 1958 the lighthouse was the first in Scotland to be run on electricity and last to be built as a manned station. It is located 58 degrees 36.9' N, 4 degrees 0.75 W and was a landmark used by fisherman for years to distinguish between the west fisheries of the Atlantic and the east fisheriesof the North Sea. It has a low (35ft) square white tower, the traditional circular tower design being abandoned due to internal fittings having to be made to order. Strathy completed the north coast lights between Duncansby Head (1924, also square tower) and Cape Wrath. It was converted to automatic in 1996 and the final remaining keeper left on the 31st March 1997. The light was extinguished in early 2012. The lantern flashed white every twenty seconds and its nominal range was 27 miles. There is also a fog horn that had four diaphone blasts every 90 seconds. Built with money from the Millennium lottery fund Strathy has a village hall located next to the bridgeover the River Strathy. A good viewing point to the village is at the graveyard on the hill to the east of the river. Also located here is the environmentally friendly Ranger shelter and toilet.